Finally I am (as usual) super-excited to have both of the men/boys nipping up for short visits in the next two weeks, first Hoob and the darling Raven this weekend (we three are heading to a 21st together, should be a hoot), then the following week Pog will be zooming up for a few days too. Hurrah – such a treat – it’ll be all gluten-free vegan action in the kitchen, bring it on! Preheat the oven to 180˚C. Put the olive oil and red onion in a large roasting dish. Cut the kumara into 3-4cm pieces, core the capsicum and slice into 1 cm wedges. Add the kumara and capsicum to the onion, season well with salt and pepper, cumin seeds and chilli flakes and toss to coat in the oil. Roast the vegetables for 15 minutes then remove from the oven and turn kumara pieces over. Drizzle with honey and return to the oven to cook for a further 10 minutes, then remove from the oven and set aside. Bring a large pot of water to boil, season with sea salt and add the couscous. Boil for 7 minutes then drain well. Add to the dish of roasted vegetables and toss so that the couscous absorbs some of the seasoned oil. Leave to cool to room temperature (or refrigerate to use later). Put the yoghurt and mayonnaise in a bowl and whisk to combine. Add the harissa and swirl through so it is semi-combined. To serve, spoon a few tablespoons of dressing onto the bottom of a large serving plate and top with 2/3 of the watercress. 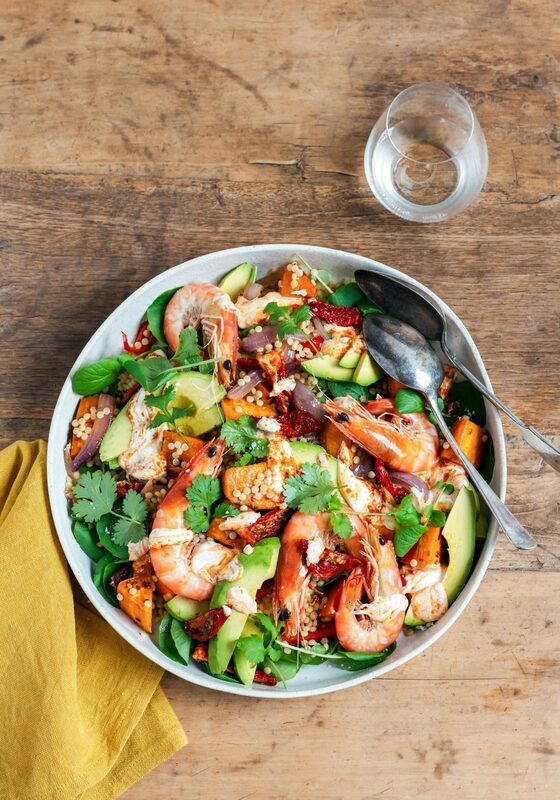 Layer on 2/3 of the vegetables then remaining watercress, avocado, semi-dried tomatoes, prawns and coriander leaves. Sprinkle with sea salt and black pepper, drizzle with mayo dressing, and serve a little extra dressing on the side. Yum ! I got the goodies I needed to make it this w/e.